GRAND CANYON VILLAGE, Ariz. — Having nine platforms where you can stand almost on the edge of the canyon and look down, where you can have overlooks of the canyon, the trails and some parts of the Colorado River, where you can hear the faraway sound of the rapid river, this is the Hermits Rest area, one of the must-go places when you visit Grand Canyon National Park. 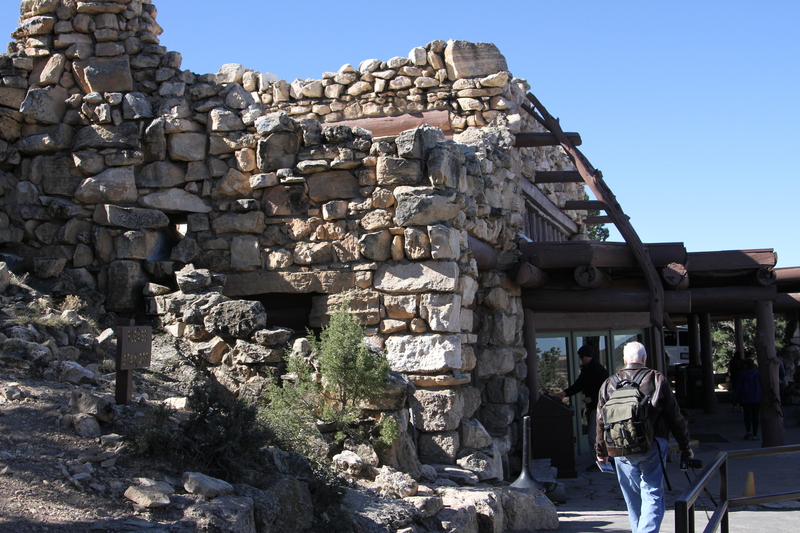 Located west of the Canyon Village, Hermits Rest is actually a resting place for visitors at the end of the eight-mile Hermit Road and neighboring West Rim Trail established to accommodate visitors influx in Grand Canyon, especially after the arrival of the railroad. A view of the Grand Canyon looking north at Trailview Overlook (Photos by Siyuan Tong). However, together with the Hermit Road, it eventually became one of the best canyon view places in Grand Canyon over the years. Though it is not the longest road in the park, it almost provides everything. Overview of the canyon and Colorado River, trails for those who love walking, and resting place with full set of facilities, Hermits Rest area has them all. It also gives you various options to enjoying the park. No matter you want to walk, bike or drive, you will always have a delightful trip. Though does note that the route will be closed to private vehicles during March 1 to Nov. 30 while shuttle buses with nine stops along the road will be running instead. Normally if you do not like doing exercise, you probably want to drive or take the shuttle bus during your visit since the nine stops along the way basically incorporate the best views. 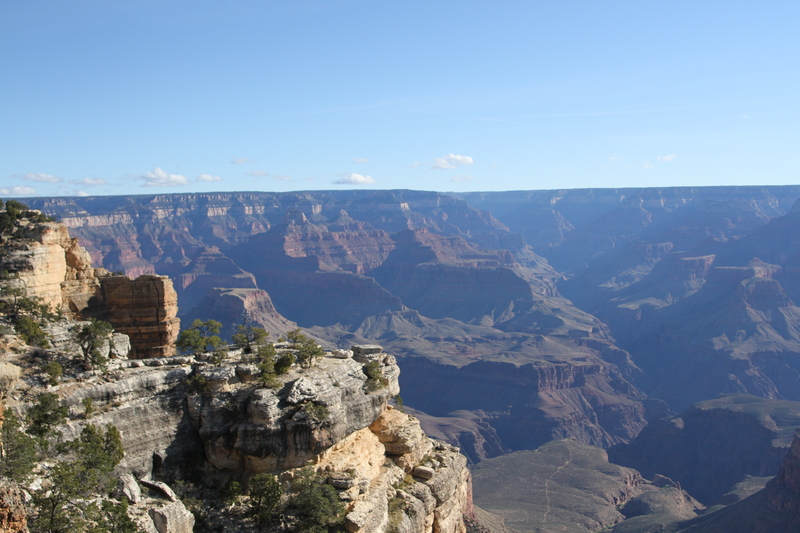 Trailview Overlook is the first stop of the west route out of the Grand Canyon Village. Like its name entails, it provides more of an overview of the canyon, Hermit Trail, the historic El Tovar Hotel, south rim village and a part of Bright Angel Trail. You can see different layers of rocks down in the canyon and different faults if you know anything about geology. The color of the rock changes according to its layers, allowing the canyon to have a beautiful consistent pattern. 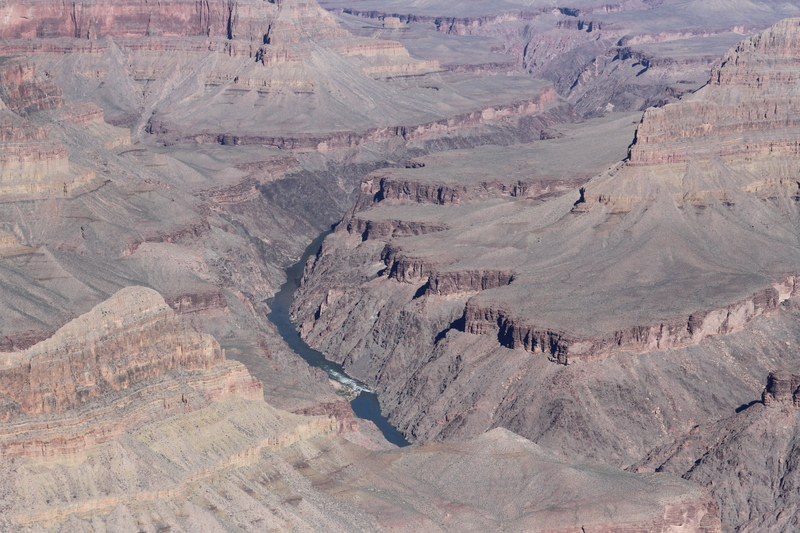 Because of the whole park is about canyon, similar partial views of the canyon are available at other stops as well. If you want a river view, not all the stops have it. Due to the river was at the very bottom of the canyon, most of the river parts are blocked by rock formation and can only be seen partially in Hopi Point, Pima Point and Hermits Rest. A look at the Colorado River from Maricopa Point. Though it is only part of the river, the view is still stunning. Dark blue of the river contrasts with the rust brownish color gives the steady picture some dynamic. If you listen carefully and it is quiet enough, you can even hear the sound of the river rapids. When you finally arrive at the Hermits Rest, an arch of piled stone with carved “Hermits Rest” and a cute broken mission bell is the first thing you see. It was designed by architect Mary Colter, a woman who has made contributions in several parts of the park. Designed to more or less resemble the tradition of Hopi pueblo and give it more of an indigenous looking, the whole Hermits Rest has a consistent stone style. From a distance, the original building looks like a house with casual piled stones as if it is built by a mountain man. 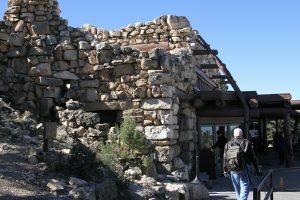 The front of the building has a porch that extends all the way to the edge of the canyon with a little stonewall to prevent visitors from getting too close to the edge. The stone style building at Hermits Rest. It hosts a gift shop and snack bar. The inside of the building is cute as well. A large fireplace in the middle of the room under the stone arch with a small platform and some chairs makes the room looks old yet cozy. Souvenirs in the shop are mostly unique. Indian-styled earrings, Native American-made paintings and crafts make it easy to pull out your wallet. Now you might already being out for a while, if you have any need, do not worry. Hermits Rest like its name is a great place for visitors to rest. A small snack place for refreshments is right next to the gift shop and the porch provides perfect place for you to sit and eat while enjoying the canyon view. Other facilities such as restrooms and water fountains can be found here as well to make sure you have a pleasant trip. Therefore, all experienced canyon visitors will tell you not to miss Hermits Rest during your visit at Grand Canyon. If you have enough time, you can spend half a day or even more to walk along the trails. If your time is limited, a quick visit for an hour or two will not let you down, either.